Our stage balls are preferred by beginners and experts alike. Give your best performance with our best-quality stage juggling balls. This is the illuminated version of our popular, original hollow vinyl Stage™ ball. Molded in flexible vinyl for a great grip with a high gloss finish. Large diameter in two sizes for high visibility. Excellent for performing. NO BOUNCE. 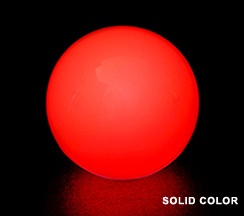 These lighted juggling balls are brightly illuminated with an LED light and available in solid colors, color change, and strobe. The color change slowly cycles through the color spectrum. The strobe flashes in multiple colors for an outstanding effect while in motion! Each light is powered by 3 button cell batteries (included) which have an average life of 10-20 hours. Simple operation with a small recessed switch. #3410 Replacement Light Kit (with batteries) $9.95 ea. This is a juggling/music concept piece in which all of the written music is derived directly from the patterns that are juggled. It was performed live at the Treat Social Club in San Francisco on 5/1/12 feat. The Realistic Orchestra. To explain the concept behind this piece I'll begin by defining the title. Siteswap: Siteswap is a notation system used to describe juggling patterns. It uses numbers to describe various types of throws. Essentially larger numbers equal higher throws or more time until that ball is thrown again. Siteswap also assumes that the juggling pattern will have a consistent pace or rhythm. For a more in depth explanation check out this video: https://www.youtube.com/watch?v=pAoLo... Circlesong: Circlesong is a musical form created by Bobby McFerrin that essentially turns a choir into a "live looper pedal." The leader sings a short idea to someone in the choir and they begin repeating it. The leader will then continue to sing more musical ideas to each member of the choir until they have created an full musical idea. The leader can then direct them to come in and out or even change their parts as the piece unfolds. Here's a great video of Bobby creating a circlesong with Voicestra and an interview of him describing his process: https://www.youtube.com/watch?v=CnlKy... How I put them together: We now know that juggling patterns can be described as a series of numbers. We can also use numbers in music to denote both pitches and rhythms. In order to merge these concepts I devised a notation system. I began by finding a way to keep track of individual objects within a juggling pattern which can be seen here: http://imgur.com/IvNv0eK Here are some examples of object tracking using common juggling patterns: http://imgur.com/cHIixJV notice that each object has a unique pattern or path. Now let's begin equating the juggling and musical patterns: http://imgur.com/jreBhzG This is the main concept behind this piece. As each juggling pattern is performed the corresponding musical passage is simultaneously performed by a member (or members) of the ensemble. These passages are then looped or repeated at a regular interval (8 bars of 6/8 time) in the manner of a circlesong. In order to best facilitate the merging of juggling and music, while attempting to maintain the integrity of both, I struck on the idea of having "active" objects and "rest" objects. In this instance the colored balls are "active" musical balls while the white ones are place keepers or "rests." Here is a short passage from the piece to demonstrate active and rest objects: http://imgur.com/zBGyCfM (0:23-1:01) When the saxophones enter each horn plays the pattern created by one object. I repeat the same siteswap pattern but gradually replace each rest object with an active object until we see and hear the entire pattern. The best examples of this concept are with two active objects (1:57-2:11) and with all active objects (2:50-3:04) Here is the full siteswap and musical notation for that passage: http://imgur.com/H175TtP Here's what the passage looks like written out for the individual saxes: http://imgur.com/iBSj0w7 Note that each pitch number also corresponds to the number of beats until that horn plays the next note. For the brass sections I use all active balls. The trombones play what is called a pyramid in musical terms while I throw the siteswaps 7531 and 8642 (or Am7 and Bm7 chords respectively) which I think kind of look like pyramids too! (especially 7531) (3:29-3:42) For the trumpets I begin throwing multiplexes or more than one ball at a time (from the same hand) so that we hear two pitches simultaneously (  ) (3:57-4:10) Finally, here's how all the parts fit together: http://imgur.com/0gxqDB4 Now that we've established parts for each instrument I begin a collaborative, improvised solo with the guitarist. Improvisation has always been one of my most favorite elements of both music and juggling (and, indeed, the concept of "flow" is relevant across many different disciplines) The idea was to essentially be free but also to communicate along the general established framework of height of throw = height of pitch and the general speed of juggling and playing. I think this is nicely illustrated from 4:29-4:37 and 4:49-4:53. I gradually reintroduce the horn parts behind the solos then finish by juggling 5 active balls which creates what is called a pedal tone on the 5th note of the scale played by all the bass instruments. (6:29-6:47) The piece ends with me throwing all 5 balls and creating one final "multiplex chord" ( (,) ) or in musical terms, an Am9 chord! (6:54) The band follows the path of each ball down and ends as they each hit the ground. Whew! Well, thanks so much for watching my video and reading this description. If it made any semblance of sense I'll consider all this work well worth it! Stay tuned! I've got a lot more juggling and music on the way! Russell Frisch 3 ball juggling with Dubé lighted color changing balls.